Even the biggest companies do ostensibly stupid things. Exempli gratia: Samsung has decided the best way to keep its own software up to date on at least some of its customers’ PCs and tablets is to stop Windows updates working, it’s been claimed. That move means that any user who is running an affected PC won’t be getting any of those vital fixes that keep them safe from malware and software exploits. Security experts aren’t impressed. One Samsung tablet owner complained about the problem in April, whilst others claim to have confirmed the issue. But Samsung was yesterday blasted by Microsoft expert Patrick Barker, who found a file called Disable_Windowsupdate.exe that was grabbed from a Samsung-owned domain and then blocked Windows Updates. Samsung even had the gumption to suggest to users “this program helps your Windows configuration settings”, said Barker. From what he saw, it appeared Samsung systems on Windows XP and above were running the SW Update software and being told to stop downloading Windows updates. When he spoke to a Samsung helpdesk representative, he was told Windows updates stopped certain hardware working on Samsung PCs, such as USB 3.0 drives. 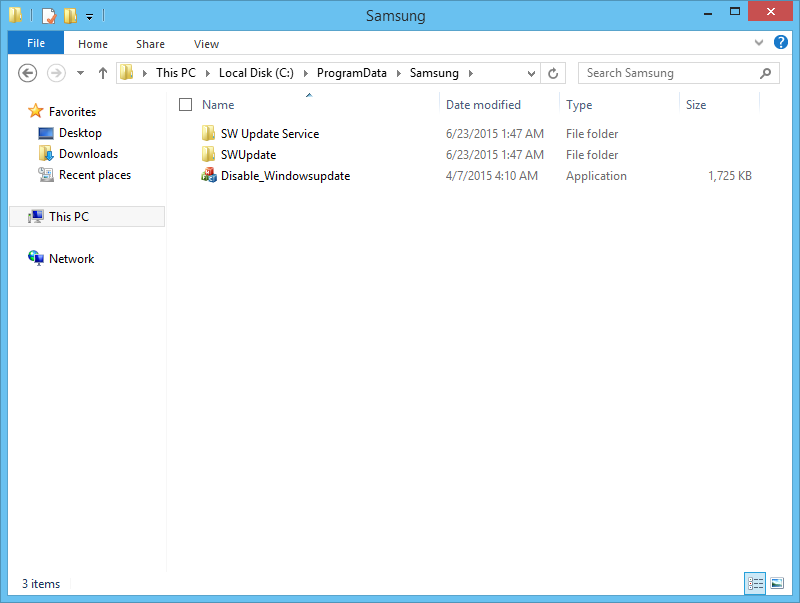 These are the Samsung update files users might want to delete if they want Windows Updates to run. Neither Samsung nor Microsoft have yet responded to requests for comment. It may be a limited issue, restricted to a select group of PCs. FORBES will update this article as more information comes in. It remains a perturbing find. “Why would you ever disable [Windows Update] in such a fashion (or in general), in a way a generic user cannot control, leaving them vulnerable?” asked Barker, claiming the Samsung file that disabled the Windows update should be classed as malware and blocked. Indeed, it seems bizarre that Samsung would choose to do this, given the backlash other PC makers have had to deal with when messing with system security. Lenovo, for instance, was panned for including “malware” on its system when the Superfish tool broke security to display ads during users’ web browsing. Superfish, one of many Israeli companies doing dangerous ad injection, has now gone out of business. “If the claims are verified to be true then this is a very worrying move by Samsung. Subverting the Microsoft Windows ‎Update Service undermines the security architecture of the Windows platform. The methods used by Samsung could also be used by criminals or others to download malicious software onto Windows devices,” noted Brian Honan, security practitioner at BH Consulting. “What will be interesting is how they cope with Windows 10 which I understand takes a different approach to updates. It is a rolling process and you get them whether you asked for them or not. Will Samsung still be disabling this in some way? This entry was posted in Uncategorized and tagged Samsung 'Killing Windows Updates To Leave Users Vulnerable'. Bookmark the permalink.